Falls can be a real problem for people with dementia and their carers, causing real stress and distress. Older people with dementia experience 8 times more falls than those without dementia (Allan et al 2009). The annual incidence of falls in older people with dementia is 70-80% (Shaw 2007). Risk of injury, including fractures, has also been found to be higher in people with dementia compared to those without (Farrell et al 2011). As well as physical injury falls can have serious psychological consequences, such as, fear of falling, loss of confidence, self-restricted activity levels and reduced social interaction (Jensen and Padilla 2011). Why Do People with Dementia Fall? There are lots of different factors that can put a person with dementia at risk of falls and fractures. Of course we can all have a slip or a trip, however, there are some factors which will increase risk. These include; problems with mobility, reduced strength or balance, medication side effects, continence problems, problems with feet/footwear, poor nutrition/hydration, osteoporosis, a history of previous falls, vision problems, hearing problems, dizziness/fainting, how you interact with the environment and confusion/dementia. People with dementia are more at risk for a number of reasons. As dementia progresses people with dementia are more likely to have problems with their mobility, strength and balance that would put them at risk. Issues such as memory impairment, disorientation and impaired judgement can also increase risk. Other risks include visual misinterpretation of the environment and postural hypotension (low blood pressure when rising). Some of the medications commonly used in the management of dementia symptoms can increase the risk of falls including antidepressants, anti-psychotics and benzodiazepines. These should be reviewed on a regular basis. Other factors indirectly related to dementia include; a lack of physical exercise, fatigue, agitation/restlessness, discomfort/pain, thirst/hunger, a need to use the bathroom and boredom/loneliness. It is very important that falls are not seen as an inevitable part of getting older, nor should they be seen as an inevitable consequence of dementia. It is important that an individual’s risk factors are identified and if possible modified. This is usually done by a health or social care professional using a multifactorial risk assessment. A personalised action plan should then be completed. 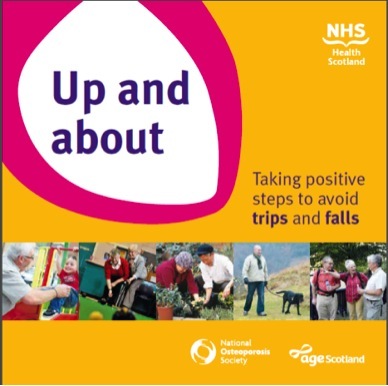 General advice about how to reduce falls can be found in the Up and About booklets which can be found at the link in the useful resources section. Special attention should be given to the environment and design for people with dementia as this has been found to reduce the risk of falls. Consideration of strategies such as contrasting colours and good lighting can help people with dementia better understand and interact with their environment and also help reduce the risk of falls. The Dementia Centre at Stirling University has a range of useful resources. Physical activity is important as it has been found to be protective against falls, so should be encouraged. Exercises which improve strength and balance are particularly beneficial. Meaningful activity needs for people with dementia should also be considered to reduce the risk of falls, especially if the person’s falls may be related to their mood and how they feel. Make Every Moment Count is a useful resource for those who support people in care settings. Falls prevention is often a real team effort, with a range of health professionals playing their part including; GP, Physiotherapists, Occupational therapists, Nursing, Dieticians, Podiatrists, Speech and Language therapists to name but a few. Allied Health Professional interventions can be pivotal to reducing the risk of falling, for example their specialist knowledge around diet and nutrition, physical exercise, environmental adaptation and adjustment etc. If you want to read more about their role in dementia care and treatment why not read Elaine Hunter’s previous blog on “what an allied health professional can do for you”. For me good falls prevention is synonymous with good person centred care. It is about meeting the person’s needs in a range of areas and ensuring the person with dementia and their carers are at the centre of all decisions and interventions. I am a physiotherapist with a special interest in dementia. I am currently seconded to the Scottish Government as part of the Up and About in Care Homes Falls Prevention Project. Allan, L. M., Ballard, C. G., Rowan, E. N. & Kenny R. A. (2009), “Incidence and Prediction of Falls in Dementia: A Prospective Study in Older People”, PLoS ONE, vol. 4, no. 5. Farrell, M. K., Rutt, R. A., Lusardi, M. M. & Williams, A. K. (2011), “Are Scores on the Physical Performance Test Useful in Determination of Risk of Future Falls in Individuals with Dementia?”, Journal of geriatric Physical Therapy, vol. 34, pp. 57-63. Jensen, L. E. & Padilla, R. (2011), “Effectiveness of Interventions to Prevent Falls in People with Alzheimer’s Disease and related Dementias”, The American Journal of Occupational Therapy, vol. 65, no. 5, pp. 532-540. Shaw, F. E. (2007), “Prevention of Falls in Older People with Dementia”, Journal of Neural Transmission, vol. 114, pp. 1259-1264.